How to give check box option to skip/hide second address if same as first (physical vs. billing address)? How can I have a check box option to skip/hide second address if same as first (physical vs. billing address). See the capture attached...to see how I "kinda-but-not-really" solved this temporarily. 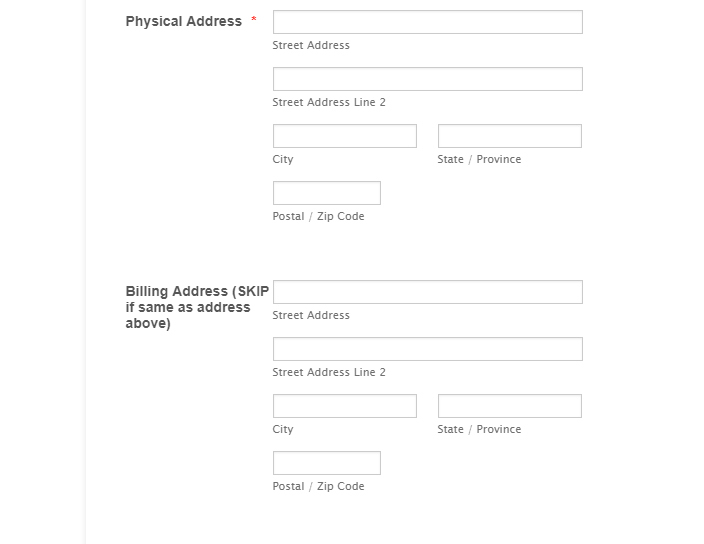 I would like BOTH addresses to be required on the form initially - but have a check box before the second address fields that says "check if same as physical address above" which - when checked - would make the second (billing address) fields disappear altogether or at least undo the REQUIRED condition. I have cloned your form and set a checkbox so when the Billing address is same as the Physical address, upon clicking it will copy the Physical address to the billing address, since both of them are required. If you think it meets your requirement, you can clone my form and copy the condition statement. Thank you....this is great help and will work! EXCEPT: How do I clone this form of yours that is not mine? I can only see it published online under the URL you sent me, but how do I see it in BUILD mode on my account so that I can copy the condition into my original form? My apology for not providing you the instruction of how to clone a form before.